Celebrate the most romantic day of all, Valentine's Day on 14 February 2018 and be seduced by the spectacular beauty of Sydney at night on one of Captain Cook's Valentine's Day Dinner cruises. 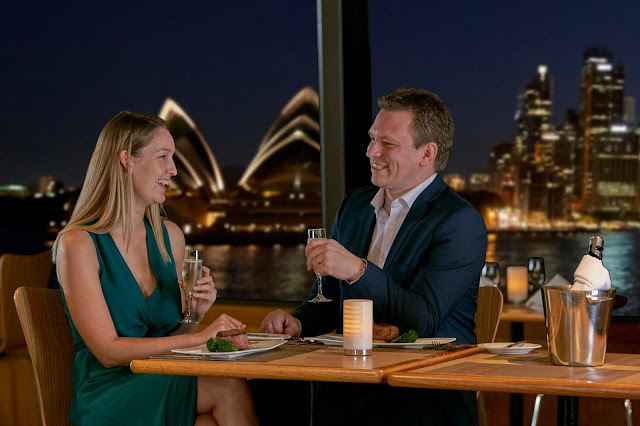 For the ultimate in romance Captain Cook Cruises Gold Penfolds Dinner & Drinks cruise, onboard the prestigious Sydney 2000 offers it all. Indulge in a six-course degustation menu, Penfolds bin and vintage wines to match each course, priority boarding, cocktail reception, lounge entertainment and an open bar of beer, house spirits and soft drinks. The Gold Penfolds Dinner & Drinks cruise is priced from $215 per person. Lovers can dance the night away to a live band and enjoy a scrumptious four-course Valentine's menu on the 7.30pm Valentines Lovers Dinner & Drinks cruise and Captains Dinner Cruise. The Captains Dinner cruise is priced at $159 per person and the 7.30pm Valentines Lovers Dinner & Drinks cruise is priced at $165 per person and also includes a Glass of Moet, chocolate gift and an open bar of house wines, beer and soft drinks. The Gold Penfolds Dinner & Drinks cruise and the Captains Dinner cruise departs at 7.00pm from Jetty 6, Circular Quay returning at 9.30pm or at 7.30pm from King Street Wharf No.1, returning at 10.00pm. The 7.30pm Valentines Lovers Dinner & Drinks cruise departs from King Street Wharf No.1 at 7.30pm returning at 10.00pm. A guaranteed window table is available for $25 per person and bar packages can be upgraded. 5pm dinner cruises and a Long Lunch cruise are also available.